Tracy, over at Leading from the Heart, is the guest host for this week’s Day in a Sentence. She asks us to consider something important — and the balance we need to strive for in our life — and reflect upon that with our sentence this week. What you do is mull over your week or a day in your week, and then boil down your thoughts into a single reflective sentence. Over at Tracy’s blog, you submit your sentence with the comment box and she will collect them all and then publish them over the weekend. Come get connected with us! This week, Lynn is hosting Day in a Sentence. She is here, with me and a few others, in Philadelphia — the City of Brotherly Love — so she asks that we try to include Love in our response this wee. Go to Lynn’s blog to learn more. Share the love! 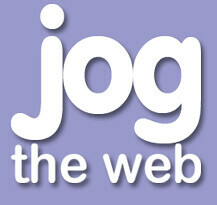 This week, I used Jog the Web for publishing the collection of Days in a Sentence. Please spend a few minutes looking at our blogs and websites and get to know each other beyond the words. In two weeks, Day in Sentence ventures over to Lynn J.’s blog, where I guess she will be hosting from the National Writing Project Annual Meeting in Philadephia. Whoohoo. Come join us. It’s fun. It’s easy. It’s a way to connect with other educators and writers around the world. You are invited! What was I thinking when I agreed to lead or co-lead so many workshop sessions in November? This week, Day in a Sentence rests comfortably on the beaches of Israel with Bonnie as the host. She asks that you consider boiling down your week or your day into a six word reflective sentence. Come on — six words! You can do it. And you are cordially invited to join us by heading over to Digital Bonnie to post your six word Day in a Sentence this week. We hope to see you there! Need some inspiration? Here is a song that I wrote last year for Day in a Sentence. Get your Six Word Groove on! Cynthia notes that her haiku is inspired by her students work with a town partnership. Jim/Jan (who is new to Day in a Sentence, so welcome — not sure if it is Jim or Jan who wrote …) noticed the week on a bright note. On the hunt for a house is Amy. Glen — my comic strip mentor — has such a marvelous way with words. Paul had a tractor. Now he has memories. Gail P. seeks some peace in the days of hectic energy. Cheryl turned to technology for her haiku, using a site called Computerized Haiku, which she suggests might be a starting point for students who struggle with haiku. I FLASH CLEAR HILLS IN THE FALL. WHIZZ! THE STREAK HAS BURST. Thanks to all you Haiku-ians and see you in two weeks over at Digital Bonnie. I TASTE CURVED POOLS IN THE DAWN. LOOK! THE MOON HAS PASSED. I’m going poetic this week. For Day in a Sentence (which will now become a twice-monthly activity as we share hosting among many bloggers, starting with Bonnie in two weeks), I ask that you consider a haiku reflection of your day, or your week. Traditional haikus are five-seven-five, but who’s counting? You write your haiku as you see fit. To contribute, just click on the comment link to this post and I will gather up the haikus and post them together over the weekend. Ken sees magic and probably can now breathe easier. What it is to be on leave, the exams marked, all the projects checked and a clear week ahead, just like the last: magic! As many of here in the United States are just starting the year, Anne is just ending her year. Have a great break, Anne! After two weeks of spring break, I am preparing revision, extra notes, correcting outcomes etc for the final three weeks that I have my senior secondary students before their VCE (Victorian Certificate of Education) exams, as this is last term for our school year in Australia. The world is full of hopefulness. And it’s a good thing Art knows enough to plan for hope. I am hoping that if I get behind in my grading really quickly, I will have a lot more time to catch up–a guy can hope! I can almost feel the energy in Lynn J.’s comments — the active learning commotion of the classroom. The seventh graders are on the rampage this week, full of questions and comments about absolutely everything! Yes, Jim, Fridays are nice days. Wow, It’s Friday. Time to stop and smell the roses. Ben has his students deep into Hawthornian terrrain. It sounds deep and exciting there. My students are chipping away bits and pieces of Hawthorne’s text to reveal characterization. Good advice here from Shaun. Was this a lesson plan almost gone awry? If you must leave something to the last moment, be prepared. Marg‘s thoughts are on the outdoors. My last week of holidays has involved mowing, pruning, mulching, weeding, planting and watering my garden, which only seems to look this lovely, each set of school holidays. it skeeves me out that the spores on the back of ferns on my desk are the ferns’ way of getting it on; i feel like i should be getting dinner and a movie if i’m this close to something so personal. As we begin talking about the American Revolution, I am hoping to relate their teenage rebellions or revolutions and feeling about rules to the colonists feelings about the British! Alex‘s poetic words mask an adventurous spirit! Have fun in those woods! Experiencing synapse-lapse, my brain flashes back greenery, scent of smoke, crisp air, and rugged mountains, making the classroom seem suddenly claustrophobic; I am so looking forward to four days of wilderness mini-break, starting tonight! It seems hardly a month gone by since the beginning of the school year and yet I’m already looking forward to the next vacation! Oooo. A bit of rhyming in Delaine‘s lines. School is in full swing, with all the madness that brings. My head was spinning a bit with the math here as Nina talks about the demographics of her class. I love that the diversity is celebrated, Nina. My intermediate ESL class at the University of Maryland includes twelve students, speaking six different languages, from three continents and eight countries! I am in heaven. Chocolate cake, Cynthia? Or ice cream cake? Or? Homecoming week is over; SACS training is over; the rest of the week should be “a piece of cake”! As the father of three boys, I have made a mental note of Mary H‘s list here. Maybe you should, too. And I can’t help but wonder about the backstory behind this sentence. Tomatoes, superglue, duct tape, bubble solution–things to keep away from three teenage brothers. Gosh, Connie, your sentence is beautiful on so many levels. Weaving a fabric of knowledge in my fifth grade class; linking all subjects in a huge tapestry that has “change” as its central theme. Gail P and I are starting to speak the same language — which is good, since we are colleagues. But I think that this year’s push into Literacy and other areas will be helpful for teachers like Gail (Kindergarten) and me (Sixth grade) to converse about our school curriculum in meaningful ways. Right, Gail? Communities of practice and standard based report cards are helping teachers communicate about how we can all assess with the same tools, and benchmarks. Tracy had experiential learning on her mind — something I wrote about in my own Day in a Sentence the other day. I’m jealous of Kevin though remembering community building with our students as we zip lined on the first day and apple picked last week, also thinking that community building is an ongoing process and can’t end when we pack up at the end of a fun day. Mary gives a good recipe for creativity in the digital age. Word and images, images and words, add music and narration for a digital composition in Photo Story 3. May the End soon arrive for you, Cheryl, so that you may begin again. Our students and teachers are in a holding pattern while waiting for our state wide testing to come to an end. Welcome back to Day in a Sentence, which took a respite from the action but is now back in action. I invite you to consider joining us for this week’s Day in a Sentence — the first since June, I believe — and it is simple to participate. I am starting to set up a bimonthly schedule for Day in a Sentence to roam the blogging planet and if you are interested (a bunch of you already expressed interest via our Day in a Sentence survey, so no need to repeat), please leave me a note with your sentence. I am getting geared up for going down the river on our annual Whitewater Rafting Adventure with our entire sixth grade. I look forward to your words. I took the summer off from hosting the Day in a Sentence feature that mostly takes place here at this blog, but also travels very nicely (it packs tightly into virtual pockets) to other blogs. I’ve been the main host for some time and I started to have doubts about whether to keep it going, to be honest. (And as a back story, the Day in Sentence did not originate here — it started with another blogging friend — The Reflective Teacher — who decided to retire from blogging and he gave me the go-ahead to continue with Day in a Sentence at my blog, along with help and wonderful support from from Bonnie). Anyway, last week, I sent an email out to the 100-plus folks on my Day in a Sentence list and asked them to take a quick survey to gauge their interest in continuing the feature and if they would be willing to take on more of the hosting duties. 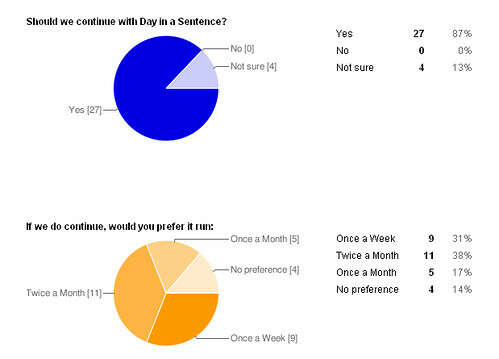 I was so happy that so many folks took the survey (see the results above). Clearly, we all see the value of this reflective writing and the connections that we make. Not one person said “no” to the concept of Day in a Sentence. That was a powerful statement to me. It also helped that Bonnie and I used Day in a Sentence as a prompt at our new iAnthology networking site and folks just loved the idea and wrote such powerful reflections. It reminded me of why I got hooked so long ago. And Day in a Sentence will start up again this coming week. If you are visiting this blog and want to host the Day in a Sentence feature one of these weeks, just let me know via the comment section here and I will add you to the eventual master list of hosts. I like that Day in a Sentence will be on the move, traveling the world on the fuel of words!